When the food bank was first built in 2016 behind our 7north thrift store, it was created to serve as the only beaches food distribution center responsible for the collection, inspection and organization of food from our local grocery store partners. Once established, we were able to receive a steadily flow of goods for our two client-choice food pantries as well as provide food to neighboring agencies in a “business to business” approach. 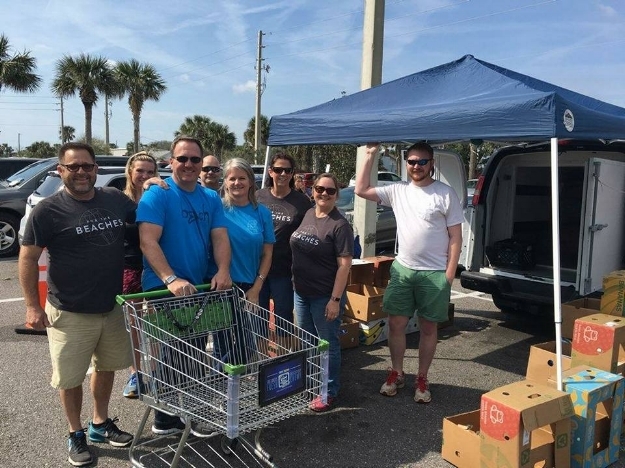 With a small food bank staff of two and 44 weekly volunteers, we also added another our approach to meet the needs of our food insecure beaches community: mobile food pantry operations. A mobile food pantry is a food distribution strategy that removes the barriers preventing access to under-served areas. It allows for the delivery of rescued food and grocery products including protein, produce and other goods to meet the needs of the public right where they are in a “business to consumer” approach. An average of 2,800 pounds of food to Mayport Market, a food distribution site in the cafeteria of Mayport Elementary School every Duval County Public School early release day. Our successful Mayport Market initiative is in partnership with Palms Presbyterian Church. An average of 6,000 pounds a month of meat, bread and other items to St John the Baptist Catholic Church for their mobile food pantry on the third Saturday of every month. This poundage is in addition to the food we provide to them to help stock their food pantry. An average of 1,800 pounds every other week to Pablo Hamlet, one of Jacksonville Beach’s subsidized senior living facilities. This gives us an opportunity to provide food to seniors who live independently, but who are not able to visit one of our brick and mortar pantries. An average of 1,800 pounds every week to Pablo Towers, which has a similar demographic of Pablo Hamlet. These two senior living facility mobile food pantries are in partnership with Elderly Housing Management Corporation. We would not be able to do this important work without the organizations behind the scenes that provide these food and grocery donations. Our admirable partners include Feeding Northeast Florida, Lucky’s Market, NS Mayport Commissary, Publix Super Markets, PVS Studios, Target, Walmart, and Winn-Dixie. While we continue to operate our Jacksonville Beach and Mayport food pantries (including expanded weeknight and weekend hours), our mobile food pantry outreach has given us an opportunity to meet a different demographic—those who face transportation and/or time constraint hardships while providing for themselves and their families on a limited income. Last year alone, we distributed more than 114,000 pounds of food through our mobile food pantry operations. BEAM would like to thank the volunteers that participated in National Volunteer Month this April! Publix Serves Day volunteers who built two new boxes in the Grace Garden, painted the Jax Beach food pantry and sorted food at our Beaches Community Food Bank. BEAM helps make a difference in the lives of those in our community, and we would not be able to do so without the help of our faithful volunteers. Beach Church in Jacksonville Beach donated 8,793 pounds of food. Grace Garden Celebrates its 5th Birthday! This April marks five years since the inception of our beloved Grace Garden. What was once an overgrown and untamed backyard to BEAM’s headquarters, is now a serene and peaceful neighborhood gem providing thousands of pounds of produce to families in the beaches area. Since 2013, Grace Garden has produce more than 27,500 pounds of produce for hardworking families in our beaches community. Getting the garden to where it is today was no easy task. It took vision, persistence and lots of community help. 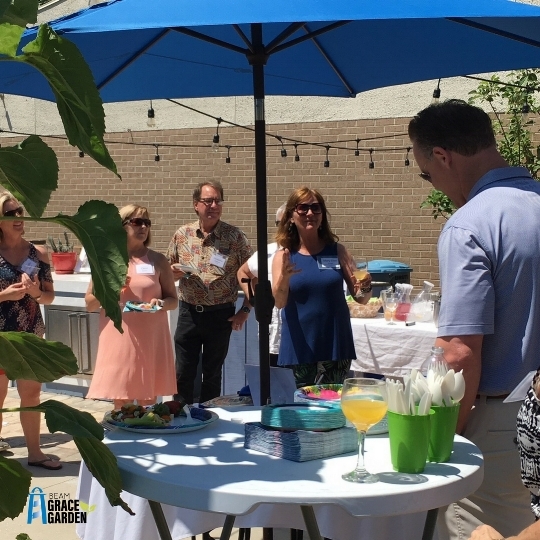 Integral partners from idea to execution include the City of Jacksonville Beach, UF/IFAS Duval County Extension Office, Home Depot-Jacksonville Beach, landscape architect Kelly Elmore and numerous skilled volunteers and financial supporters. People from all walks of life have touched Grace Garden and been affected by its beauty and character. We welcome our regular weekly volunteers (including two retired master gardeners), church life groups and their children, community and corporate groups. All have had a hand in creating a lively and sustainable garden year-round. Aside from the nutritious food that fills our pantries, the garden also provides a learning opportunity for clients and their children. BEAM’s Registered Dietitian Nutritionist Rachel McCandless uses produce from the garden to prepare food tastings and cooking demonstrations for clients. She also works closely with those who have been diagnosed with Diabetes or Hypertension to teach them how to incorporate positive lifestyle changes in an effort to manage and relief their chronic disease symptoms. Lastly, Grace Garden serves as a peaceful space for clients and beaches residents alike to relax, decompress and enjoy nature’s beauty. How can you help? 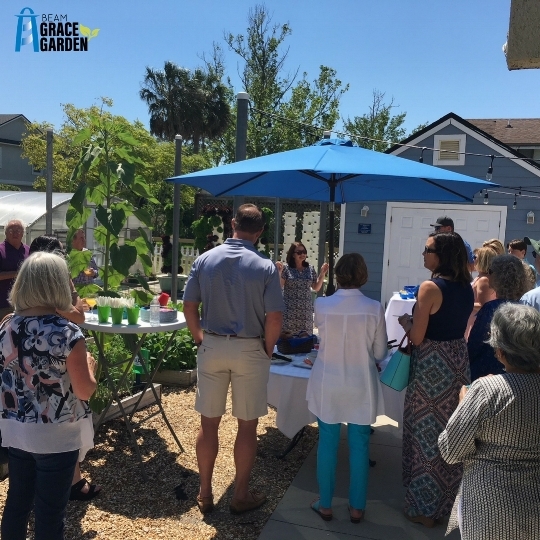 Please consider sponsoring a Grace Garden raised bed for $250 a year or aeroponic tower for $350 a year, which provides BEAM’s pantries four seasons of fresh fruits and vegetables. It’s a perfect gift for Mother’s Day! (904) 241-7437 X1 or email to susan@jaxbeam.org. Thank you for your generosity and support!! Your gift of appreciated stock will not only help us achieve our mission-critical goals, but it is an easy, tax-smart way for you to give to BEAM. For more information and because electronic transfers often arrive with no donor name attached, we ask that when donating stock you contact Susan King at (904) 241-7437 X1 or email to susan@jaxbeam.org with your name and the number and type of shares of your donation. This allows us to attribute your gift correctly, send you the proper tax documentation, and thank you for your generosity and support.